The intrinsic precision of Patrick Somerville’s 2009 novel The Cradle may not be its most striking feature, but it was arguably its most rewarding. The novel’s structure incorporated parallel timelines, dancing around the fate of one major character while offering tantalizing glimpses of how others were connected. In its own subdued way, it also tackled sizable themes, grappling with issues of parenthood and politics, and showing a welcome willingness to deconstruct both. Some of Somerville’s short fiction hews to a similarly realistic aesthetic — his recent “A Game I Once Enjoyed,” for instance, which abounds with conflicts explicit and implied. 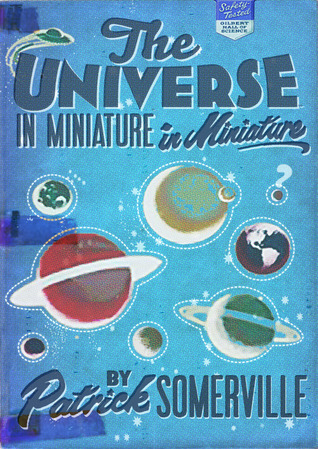 The Universe in Miniature in Miniature, Somerville’s second collection (after 2006’s Trouble), is something very different. These stories fit together in a more than arbitrary way: images and themes and names recur, even if characters do not. To call this a novel in stories would be fundamentally inaccurate, but there does seem to be an underlying logic here, a connection shared among these fifteen stories. This is most obvious in the two stories that bookend the collection, but is also manifested in (or is a manifestation of) several other moments that occur throughout the book. A series of stories, each titled for their narrator — “The Cop,” “The Mother,” “The Son” — explore different facets of a random killing. The crime itself resounds throughout the collection: the narrator of “Easy Love” is the doctor who tries to save the victim. Reading these stories in conjunction prompts questions: Was this an attempt to give voice to a seemingly minor character felled as a background prop; a sort of re-establishment of a humanist order? Elsewhere, that humanism becomes more explicit. The title story, focusing on a trio of students at a highly conceptual institution of higher learning, threatens to become painfully twee (its narrator makes dioramas of people making dioramas) before turning on itself and becoming an exploration of ironic affect. Some of the details are eminently realistic, while others (such as the nature of the academic institution, and the surreal way in which the students make progress reports) belong in some off-kilter post-Chestertonian world. That institution is both foreshadowed and mirrored in “The Machine of Understanding Other People,” the novella that closes the collection, incorporates economic collapse, secretive family histories, and unconventional inheritances; it, too, balances realism with elements gleefully echoing pulp-adventure tropes. Images and ideas float between the two stories, less in a cause-and-effect relationship and more in the sort of haze of implications that one might encounter in the fiction of Steve Erickson or Chris Adrian. Perhaps it’s more accurate to use a more accurate designation: dream logic. At times, this is explicit: the horror-tinged “Vaara in the Woods” finds its narrator (who may well be Patrick Somerville) dreaming of his family’s history and ruing the images those dreams bring forth. The concentrated experience of reading The Universe in Miniature in Miniature is to find oneself disoriented. This is a book, ultimately, that requires its own navigation — or, to build on the title’s metaphor, its own instructions for assembly. On its own, it’s a deeply successful marriage of surreal structure and aching empathy. Taken together with the neatly ordered The Cradle, it marks Somerville as a writer with enviable range and honorable concerns.